From the Baldwin County Courthouse, go west on Hancock Street for 2 blocks or 0.2 mile (or the one large block containing Georgia College & State Univ.). Turn right on Clarke Street. Go one large block or 0.2 mile. Turn left onto Highway 22 west (Montgomery St.). Go 2.4 miles. Turn right on Highway 212. Go 5.9 miles. Turn left on Avery Store Rd. Go 1.5-1.6 miles to a logging road on the right. Do not travel on this road without permission from Weyerhauerser Company and knowledge of the road condition. Go .3 mile and bear left at the fork. Continue .5 mile and park. Walk about 400 feet to the right. This area was planted with small pines in 2001. Walk through the pines to the second small ridge. 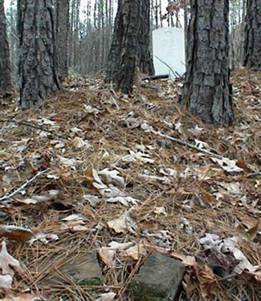 The graves are on top of this small ridge. The Jesse Doles home and burial ground were on the old Monticello stage road, now a wilderness (Union Recorder, May 18, 1939) and owned by Weyerhauerser Company. We thank Weyerhauerser Company for clearly marking and protecting this cemetery. Believed to be wife of Jesse Doles. Name per Cherokee Land Lottery. Grave found in 1939. No longer visible. See Union Recorder, May 18, 1939. 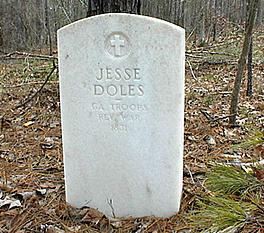 Possibly the grandson of Jesse Doles. Grave described in Union Recorder, May 18, 1939. No longer visible.